Evi is a sweetheart. They are from large, high-content wolf dog parents. Mother is Evi - mid-size, high-mid content Timber Wolf (click here for Evi's Blog) and Father is Zev - very high-content, extra-large Mackenzie Valley Wolf (click here for Zev's Blog) Litter is CKC Registered. Evi is a high content wolf dog. She had her first litter of puppies with Zev in September, 2011. She is the daughter of DaBear and Titus. She was born last year. 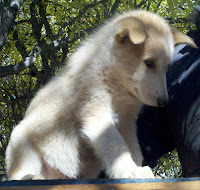 Unfortunately, Evi is not for sale, however, her wolf dog puppies are - so check the NEW! Puppies Page. Evi is CKC Registered. Zev is a very high content hybrid Mackenzie Valley Wolf Dog. He is the son of Shika. Unfortunately, Zev is not for sale, but his puppies will be. Zev is CKC Registered. SOLD! Juliette is a Female Dark Grey Timber Wolf For Sale. CKC Registered. Click here for Juliette's Personal Blog. SOLD! 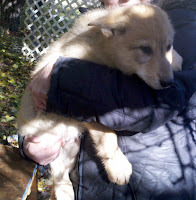 Zennia is a Female Light Tri-Color Timber Wolf For Sale. CKC Registered. Click here for Zennia's Personal Blog. SOLD! Punky is a male light tan Timber Wolf for sale. CKC Registered. SOLD! 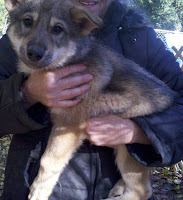 Bilbo is a male, tri-color Timber wolf for sale. CKC registered. SOLD! Colt is a male. Medium-gray Timber Wolf for sale. CKC Registered.